Romford Market will be open every day from Wednesday 12 to Monday 24 December. 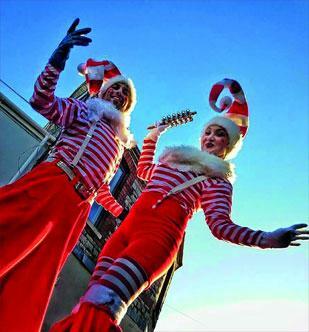 The Christmas stilt walking elves will be in Romford’s Market Place on Saturday 15 December. The historic Romford Market, for which a charter was granted by King Henry III in 1247, will be extending its hours in the run-up to Christmas to make it easier to pick up Christmas decorations, gift bargains and everyday essentials including fruit, veg, fish and meat. Romford market is one of the largest street markets in the South East of England with over 150 regular stalls offering a diverse range of goods including the latest fashions, mobile phone accessories and household goods together with a great choice of tea and hot food stalls. A free wrapping station will be available just outside Debenhams from 15 December. Buy anything in the market and one of the Market’s Wrapping Elves will wrap it for free. Just collect a voucher from any of the market's traders to take advantage of this service. Santa will also have his own post box in the middle of the Market. Any youngsters, whether naughty or nice, posting a letter to Father Christmas will receive a personalised reply. To add to seasonal festive spirit, the Market will have stalls selling mince pies and mulled wine, toys, children’s clothes, gifts for all ages, up to the minute fashion for Christmas parties, Christmas trees and a variety of decorations, as well as smaller gifts for under the tree. There will also be entertainment in the Market Place from Saturday 15 December until Christmas Eve. This will include a free mini funfair with a ferris wheel, and a free interactive giant snow globe each day from 10am to 5pm (3pm on 24 December) where you can take your Christmas photos. In addition special events will be held on Saturday 15 and 22 December. On both days a mini Christmas concert will be held on a stage sponsored by Time 107.5FM. This will feature Percy the tap-dancing penguin, Little Miss Santas, a “Frozen” sing-along and performances from a number of children’s favourite characters. Stilt-walking Christmas elves will also make an appearance in the Market Place on 15 December, and on 22 December there will be a chance to meet a real reindeer and see the Ice King and Queen performing juggling tricks. “The Market Place has long been the heart and soul of Romford town centre and is a proud part of Havering’s heritage.